I'd like to know if you follow me on my other networks, or if you only use Devianart for that! Please tell me what I have to do! *chantonne* JOYEUX ANNIVERSAIIIIIIIIIRE! JOYEUX ANNIVERSAAAAIRE! 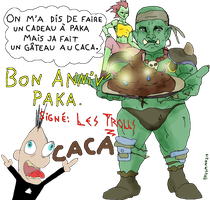 JOYEUX ANNIVERSAIRE, PAKAAAAA! JOYEUX ANNIVERSAAAAAAIRE!